Finding a good spot to photograph furniture in my house is a huge challenge. I'm telling you this, because you will see what I mean in a second. I really only have one spot to photograph new pieces. It's the easiest spot for me to move stuff out of the way, and have half way decent lighting most of the time. We have an east / west facing house, so the lighting can get pretty harsh if I don't time it right, and today is one of those days. So blah blah blah, excuses, excuses....that's what I'm dealing with today! I have to get this down to Aunt Bee's House while we have dry weather and before a large piece that sold gets taken home this weekend! 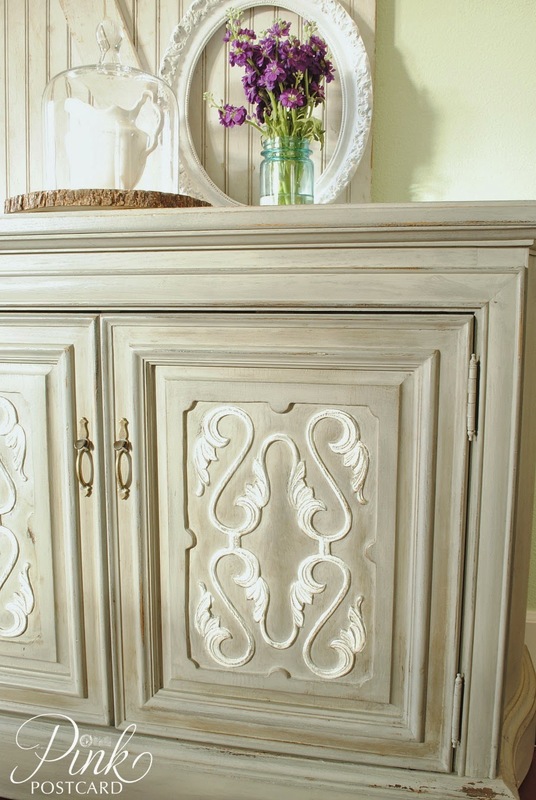 I love the shape of this little cabinet / buffet. It's such a nice compact size and has curved sides. When I first found it, I expected to open it up and find the skeleton of a record player unit. It was great to see that it had real, useable storage! A removable shelf, and two drawers that have a nice glide. 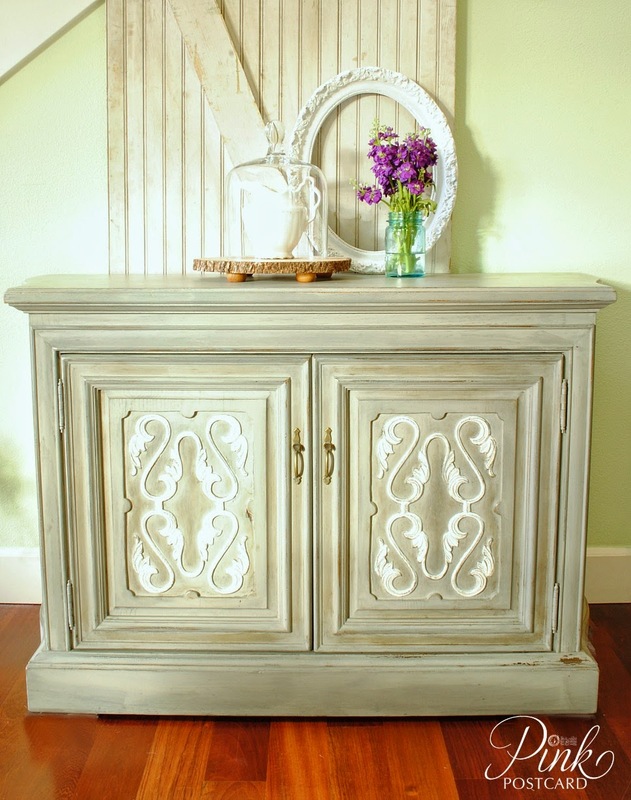 Perfect for an entryway or small dining area. This was my first time trying out Trophy in Miss Mustard Seed's paint line. I really like it. A nice deep gray color, and I can't wait to play around with it more! To top it off, I am highlighting a few smaller pieces that I will be taking to Junk Salvation with me. 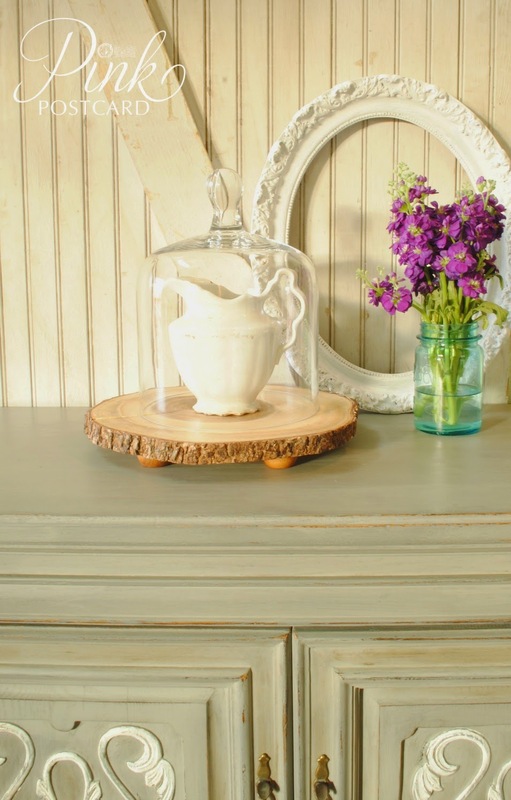 Vintage frames, cloches, and several vintage ball jars. I will have to say though, that the ones I am taking are nicer than the one here. I happened to have this little bouquet of flowers near my sink, and I borrowed it for the photo shoot. We're off to deliver this piece to the shop! Lovely piece! I totally understand about finding it hard to get the right light to photograph pieces-yours look great! Lighting.... one of my biggest challenges in our home too. I think your photos turned out great! I have been practicing with the tripod and timer because that lens needs to be opened a lot longer than I can hold still for! That cabinet is awesome. 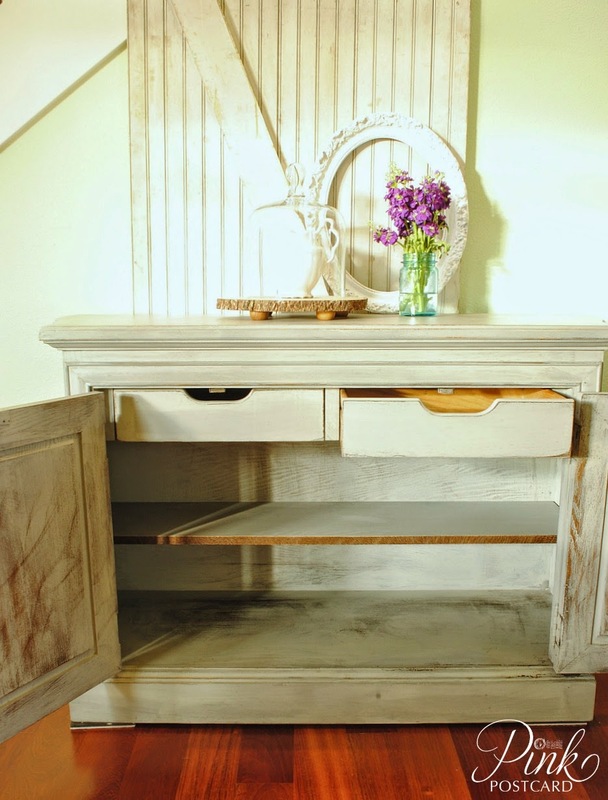 I have yet to try MMS Milk Paint but want to. I love that color you used! It's gorgeous, and with all that storage I'm sure it will fly out of your space. I love the color you chose and the highlights too. Your picture looks really good to me, but I know what you mean about the lighting challenge. I was trying to get a decent picture of a project I just finished and the light is awful in that area of the house. The only light is late afternoon and then the shadows are dancing all over the wall. So frustrating.